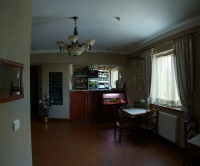 There is a cozy café in Builing1, where you can order traditional Ukrainian cuisine and grill menu. Welcome to taste delicious breakfasts, fixed meal s and suppers. We take orders for banquets, receptions and other celebrations. Our banquet hall can comfortably accommodate 30-35 people. Live music is by prior agreement. Our hotel provides twenty-four-hour room service, there is free Wi-Fi access to Internet also.